Quick show of hands. Who wants to spend tonight reading a contract!?! So, I’m pretty sure I was the only one getting quite so pumped to spend quality time with a legal document. Well, maybe a few of you lawyers out there…but even then, maybe not. I’m a weirdo. I love that stuff. 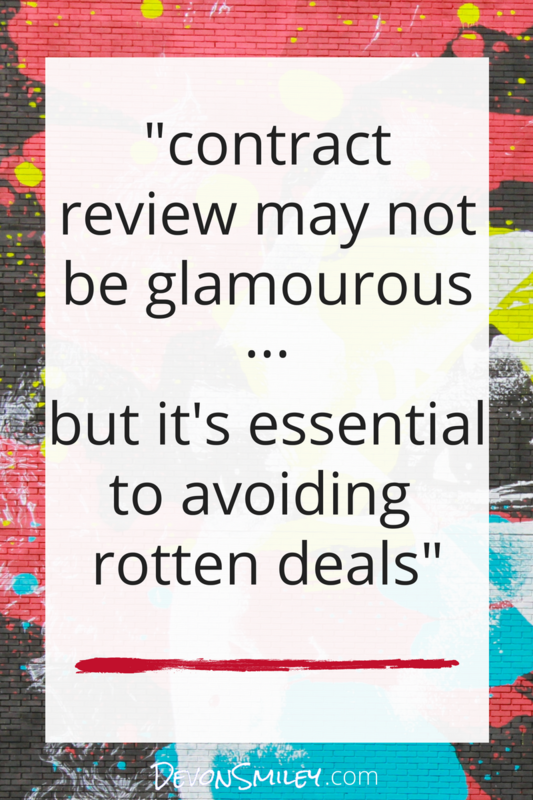 But if you don’t get the same sort of thrill I do, chances are that when it comes time to review a contract for your business you’ll give it a quick skim, sign it, and then stick it in a drawer. That may be quick and easy – but it’s also dangerous. Today, I’m going to share with you my time-tested process for working your way through a contract so that you understand it, and have some sort of sanity left at the end. Step 1. Make this as pleasant as possible. Yoga pants, a fresh cup of coffee, a candle – get started on a nice, calm, comfortable foot. Give it a skim. No pencil. No highlighter. Just give it a read. Then take a break. 15-30 minutes on something else. Give it a purposeful read. You’re on the lookout for a few things: any words or concepts you don’t understand, and any items you do understand, but leave you cold. Or pissed off. Make notes of all of these things. Then take a big break. Like – 24 hours. You need to give your brain and the document some time to breath. There's no point obsessing over things at this point. You've got the lay of the land...so time to let things just simmer a bit. Get online and start noodling around for those terms you didn’t understand and write them down in your own words. If you have a friend with more experience, a negotiation consultant on call *cough cough* or legal counsel they can help you with figuring what things mean and what the potential impact could be. Step 5. Get ready to make the ask. Time to negotiate! This blog would be far too long if I got talking about this step – I’m far too passionate about it – but there are lots of articles and videos on the site here devonsmiley.com that can help, so I’m going to link to those below. One last thing! If this seems like it takes a while. It does. If someone is pressuring you to sign a document on the spot and gives you attitude…that’s a warning sign. Take the time you need to understand the deal and transform it into one that not only works for you – but lights you up.